When you step inside Saint Nicholas Antiochian Orthodox Cathedral in Downtown Los Angeles you are immediately transported into another world. Its stunning stained-glass windows and highly ornate architectural decorations make for a grandiose wedding ceremony setting for couples. For those of the Orthodox religion, this beautiful building is the ideal location to exchange your vows and conduct rituals which are integral to your faith, with your family and friends as witnesses. Slowly walk down the aisle between its elegant wooden pews towards an altar backed by stunning religious frescoes and golden trimmings. Chandeliers provide soft lighting, which is enhanced by natural beams shining through the stained-glass side panels. This dimly-lit atmosphere creates dramatic and creative wedding photos, with rich colors and strong details. Unlike many houses of God who restrict wedding photography access, at Saint Nicholas Antiochian Orthodox Cathedral photographers are allowed to shoot from both the left and right hand sides of the altar. This allows for beautiful close-up portraits of the bride and groom’s faces as they exchange vows, as well as candid shots during traditional rites and rituals. The second floor balcony also allows for elevated wide-angle shots, taking in your ceremony proceedings and congregation. In addition to its exquisite interior, the leafy exterior courtyard of Saint Nicholas Antiochian Orthodox Cathedral is a charming spot to mingle with guests after your ceremony and capture family formals and bridal party photos. 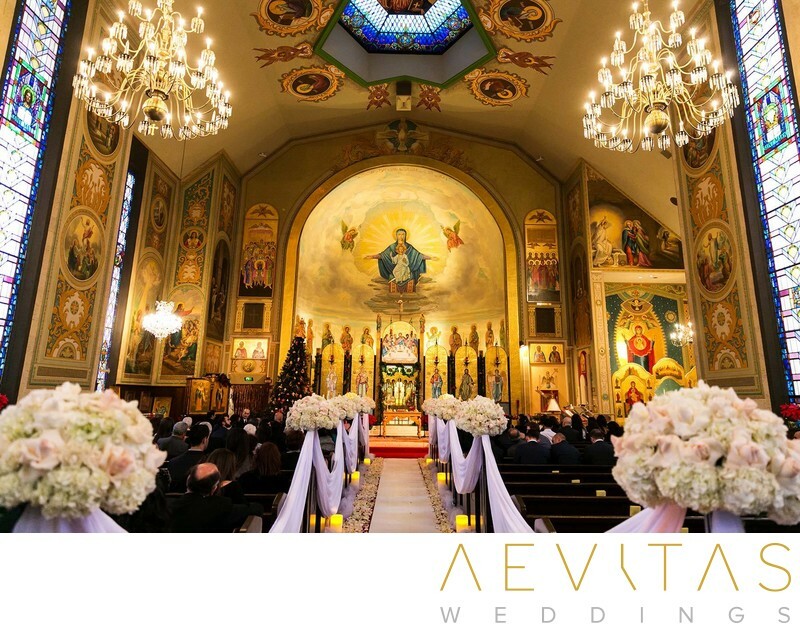 While other weddings may be held on the same day as yours and time is often restricted, the wedding photography potential of Saint Nicholas Antiochian Orthodox Cathedral is undeniably outstanding.